I'm pretty much stuck on Sunflowers this week. When I planted these about 6 weeks ago, I had no idea they'd grow so well, in the fall. They are now 5 feet tall, and growing. As you can tell, we had some rain this week. Lovely photo. I liked your Brenda's photo challenge post very much. Awesome photo! Thanks for stopping by my place. You asked if it was a gray bleak day or if I took the photos in black and white. It was a cold, windy and gray bleak day! Take Care!! 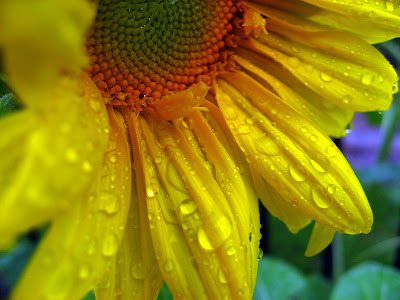 I love flowers with raindrops on them! Gorgeous picture Jan! This is such a great shot and very pretty! Very!